County Durham is a county in North East England. Its county town is Durham a cathedral city. Counties are usually named after their principal town but Durhamshire never came about possibly to some extent due to the relationship with the Bishops of Durham, who for centuries governed Durham as a county palatine. The county borders Tyne and Wear, Northumberland, Cumbria and North Yorkshire. County Durham has a mixture of mining and farming heritage as well as a heavy railway industry particularly around Darlington its largest settlement, Shildon and Stockton. Its economy was based on coal and iron mining. The area is being promoted as a tourist destination. In the centre of Durham, Durham Castle and Durham Cathedral are UNESCO-designated World Heritage Site. Teesdale is a dale on the east side of the Pennines. Large parts of Teesdale lie within the North Pennines Area of Outstanding Natural Beauty the second largest AONB in England and Wales. Teesdale’s principal town is the historic market town of Barnard Castle home to Bowes Museum. Teesdale holds a number of villages and small towns including Middleton-in-Teesdale which was a lead mining centre, traces of the mining industry can be seen in the adjoining slopes and side valleys. On the south side of Teesdale is the Bronze Age burial site of Kirkcarrion. The famous waterfalls of High Force, Low Force and Cauldron Snout can be found over ledges in the Whin Sill. Part of Upper Teesdale near the Cow Green Reservoir is designated a National Nature Reserve. The River Tees rises below Cross Fell, the highest hill in the Pennines at 893 metres (2,930 feet) and its uppermost valley is remote and high. It flows through Teesdale before passing between Barnard Castle and Startforth continues south of Darlington then passes Stockton-on-Tees and Middlesbrough before reaching the North Sea south of Hartlepool. Bowes, situated close to Barnard Castle, is a village in County Durham located in the Pennine hills. It lies within the historic county boundaries of the North Riding of Yorkshire but along with the rest of the former Startforth Rural District it was incorporated into the non-metropolitan county of Durham for administrative purposes on the 1st April 1974. Bowes is built around the medieval Bowes Castle and until the 1960’s the village was served by Bowes railway station. The only pub in the village is a 17th century coaching inn and is said to be haunted by several ghosts. The famous author Charles Dickens found inspiration in the village academy, which he immortalised as Dotheboys Hall in Nicholas Nickleby. Two of the people who inspired characters portrayed by Dickens are buried in the churchyard. The River Greta and the Pennine Way both pass through Bowes. Bowes Castle was built within the perimeter of the former Roman fort of Lavatrae in the 12th century, Lavatrae being the Roman name for Bowes. The early timber castle was replaced by a stone structure between 1170 and 1174 on the orders of Henry II. Bowes Castle withstood Scottish attack during the Great Revolt of 1173 to 1174 but was successfully looted by rebels in 1322 while the lord of the castle was away. It was already in a poor state of repair and conflict with Scotland led to further raids against the castle and the surrounding manor and by 1340 the castle was in ruins and the manor worth nothing. Whilst still in ruins Bowes Castle was reclaimed by the crown in 1361. In the mid 1400’s it was controlled by the Neville family before reverting to the crown again. James I sold the castle in the early 17th century. The castle went into decline and was largely dismantled after the English Civil War. The ruins of the mainly intact keep survive and are protected as a Grade I listed building and as a scheduled monument. The ruins are now owned by English Heritage and ran as a tourist attraction. Sleightholme Beck, a tributary of the River Greta, passes through a narrow gorge known as The Troughs, a Site of Special Scientific Interest. The site covers the gorge between the hamlet of Sleightholme and the confluence with the River Greta about 1¾ mile upriver from Bowes. The site has both biological and geological interest and has been designated of National Importance in the Geological Conservation Review. The River Greta, a tributary of the River Tees, rises in the Pennines and drains Spittal Ings, Roper Castle and Beldoo Moss before running east through Stainmore Forest to be joined by Sleightholme Beck, its main tributary. The river then flows through Bowes before reaching the River Tees near Rokeby Park. When we filmed this walk it was very windy so we had problems stabilising the camcorder and also with the noise from the wind but because of the content we decided it was worth adding the video to our site. Turning left out of the car park we follow the road over a bridge then through Gilmonby to a y-junction. We turn right following the sign for Sleightholme and keep following the no-through tarmac road uphill through some trees and over a number of cattle grids until we come to a farm on our left at the top of the hill. We now start to go downhill and soon after passing a barn on our right we turn right at the footpath sign, Pennine Way, through the gate. We head forwards across the field and cross over Intake Bridge then head forwards following the narrow grassy path. Soon after passing to the left of a ruined barn we turn left uphill on the faint path to the top of the ridge. We make our way to the wall and go through the gate on the left with a yellow arrow. We turn right following the wall on our right towards the farm. Opposite the farm the Pennine Way splits both ways and we keep heading forwards still following the wall on our right. Immediately before the gate we turn left still following the Pennine Way with the wall on our right. We head forwards through the fields passing through two gates then follow the track which bears right over a cattle grid to Mellwaters. At Mellwaters we turn left then at the farm track we turn right then left just past the stone trough. We head forwards through the gate into the field towards the telegraph poles. When we see the gate on the right in the middle of the trees we go through and cross over the bridge. We turn left and head to the left of West Charity Farm. At the end of the wall we turn right through the farm gate then left at the sign post. We now head forwards following the track with the wall on our left. Soon after passing the next farm, Lady Myres, we turn left through the gate signposted Pennine Way. We head forwards over the bridge then soon bear left uphill on the track. At the top we keep heading forwards along the track and then turn right at the sign post. 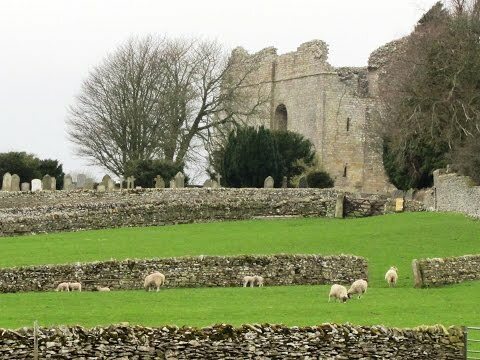 We cross over the fields and a few stiles to Bowes Castle. We go through the gate at the far side of the castle and turn right down the lane to the end back to the car park. This is an easy walk along a minor no-through road and on good paths and tracks with easy gradients. Approx 7.5 miles allow 3 hours using OS Explorer Map OL31, North Pennines Teesdale & Weardale or OL30, Yorkshire Dales Northern and Central areas. Start point: Bowes free car park. Bowes near Barnard Castle in Teesdale, County Durham. Travelling west on the A66 from Scotch Corner. Just past the end of the third stretch of dual carriage way turn left on to the small road sign posted Bowes. At the crossroads turn left and the car park is just on the left. There are no public toilets. There is a pub the Bowes Club, CIU. The next nearest town for public toilets and refreshments is Barnard Castle.